Legends: buy concert tickets now! Following on from last year’s sell out concert A Night at the Movies, we’re heading back to Cadogan Hall on Saturday 10 January to celebrate some of the most gifted composers, songwriters and entertainers ever to grace our globe. We’ll be performing songs from artists such as U2, Michael Jackson, Joni Mitchell and Edith Piaf, as well as classics from composers including Mozart and Monteverdi. 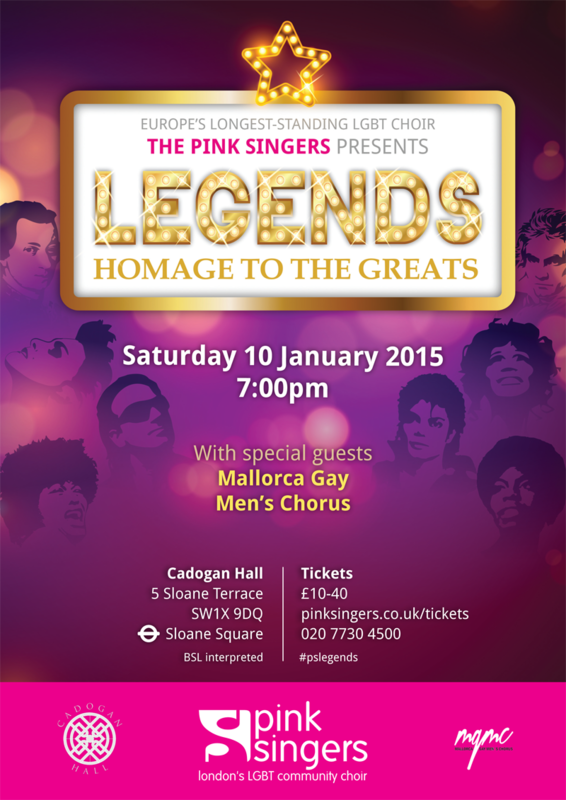 Our special guests are the Mallorca Gay Men’s Chorus. This 40-strong male voice choir, led under the musical direction of Joan Lainez, inject wonderful harmonies and Latin passion into the evening. Buy tickets now online or by calling the Cadogan Hall box office on 020 7730 4500. Oh, and don’t forget our charity single with Bright Light Bright Light is now on sale. Buy it now and help raise funds for Elton John AIDS Foundation!